Even the best of the elite runners can easily be beaten without their daily cup of coffee or caffeine before running. Some runners rely on drinking coffee before running to get them up and out the door, while others find caffeine to be the only stimulant protecting them from having Swingline tattooed across their forehead. But should you drink coffee before you run? Or is it just a ploy by the coffee companies to sell more expensive lattes. If you’re a caffeine addict, or even if you only enjoy the occasional cup of coffee, caffeine and athletic performance go hand in hand to help your running. Yup, that morning cup o’joe can actually make you a better runner. Recent studies show that more than two-thirds of Olympic athletes use caffeine to improve their running performance. You can be quite sure that if Olympic athletes are using caffeine before they run, it works. However, you don’t need to be an Olympic caliber runner to benefit from the strategic use of caffeine. In this article, I am going to outline the specific benefits of using caffeine, what to watch out for, and give you some detailed guidelines for when to take caffeine before a race to perform your best. Caffeine is actually one of the most widely researched areas of sports performance, perhaps because so many runners rely on it for more than just its potential performance enhancing benefits. In fact, Alex Hutchinson recommended taking caffeine pills before running as the number one legal performance enhancing product runners can take before a race. So if you were wondering if coffee before running is bad, by now you probably know what we have found. Just as your morning cup of coffee helps you get mentally ready to face the day, research shows that caffeine boosts your mental alertness, improves your mood, and boosts your desire to run hard. This is a great benefit for those mornings you’re facing a tough speed workout and you just don’t want to get out the door, or if you’re an evening runner who needs a mental boost after a long day at work. Even better, for longer events, such as the marathon and half marathon. If you are following a marathon training schedule, you will know that there are many long weeks of intense and monotonous training that can really test our dedication to the race. Caffeine reduces a runner’s perception of effort, which makes running fast feel easier. Caffeine increases the concentration of endorphins in the brain. Yup, those same exact hormones that produce a runner’s high. For marathon runners, perhaps the most important benefit of caffeine is that it enhances your body’s use of fat as a fuel source, thereby conserving glycogen. In marathon racing, the conservation of glycogen is critical to performance over the last 10km of the race, or as we like to call it, the second half of the race! It’s not exactly clear how caffeine increases fat utilization. Most researchers agree that caffeine increases the number of fatty acids in the blood stream, which increases the speed at which your body can covert fat to usable energy. 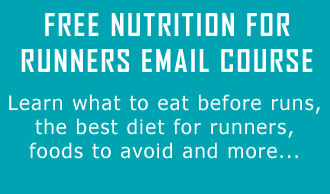 If you are trying run to lose weight (aren’t we all), this is good news. Caffeine also enhances reaction time and improves neuromuscular coordination (how fast your brain can send a signal to your muscles to contract and relax). While this is great for 200 meter sprinters, it can also be beneficial to long distance runners. Improved neuromuscular coordination allows your leg muscles to fire faster and more forcefully, which means you’ll be more efficient. You can run faster with less effort. Another recent study looked at the effect of consuming a caffeinated sports drink on performance in a warm environment. Cyclists who ingested caffeine completed 15 to 23 percent more work in hot weather than cyclists who used either water or a traditional sports beverage. Moreover, the cyclists who used caffeine had a lower level of perceived exertion. If you are running in the summer heat, this will help make it through those hot and humid summer runs. While so far we’ve looked at how caffeine can potentially improve varying aspects of running performance, it’s also important to examine if these improvements translate into actual results on race day. Luckily, a group of researchers studied this exact question. Using a 5k race as a test run, the researchers found that runners who used caffeine prior to their 5k race improved by 1.0 to 1.1 percent (this means a 20-minute 5k runner would run 10-13 seconds faster just by using caffeine). While this isn’t a huge improvement, it does prove that the science translates to real-life running situations. How Does Caffeine Affect Running Recovery? While research has clearly shown that caffeine can boost performance, what about using caffeine after a run (whether it be an ingredient in your favorite post run beverage or the result of your cup of coffee on the way to work)? Caffeine has been shown to enhance recovery when used in conjunction with carbohydrates. We talked about this in detail in our separate article about the 9 reasons runners should take caffeine. Researchers have found that having a drink with caffeine rebuilds glycogen stores 66 percent more than a drink with just carbohydrates. Why is it Bad to Drink Coffee Before Running? The biggest fear in using caffeine when running has been the diuretic effect and therefore possible dehydration issues. I’ll admit, this is what kept me from utilizing caffeine when I was running at an elite level. While caffeine is a diuretic, exercise counteracts its negative impact on hydration. A runner can safely have up to 550 milligrams of caffeine (or about five cups of coffee) without affecting hydration levels. Is caffeine is bad for your health? In moderation, caffeine consumption does not cause any health problems. The health benefits of coffee come from its caffeine content and its unique blend of antioxidants. However, heavy caffeine use can suffer from long term health problems from too much caffeine, ranging from excruciating headaches to insomnia, and it is possible to become physically dependent on the drug. So, as with any nutritional advice, moderation is key. Now that we’ve confirmed caffeine can help your performance, it’s critical to discuss how much caffeine is best for runners. How much caffeine before a running workout? The same study that measured the impact of caffeine on 5k performance found that five milligrams of caffeine for every kilogram of body weight (2.3lbs) was the ideal supplementation. A 150lb runner (68 kilograms) would supplement with 340 milligrams of caffeine, which is about 16-17oz of drip brewed coffee. Most health organizations recommend no more than 400 milligrams of caffeine per dose. Err on the conservative side if you’re heavier or you’re concerned about any health-related issues. When to take caffeine before running? Caffeine is absorbed quickly and lasts for hours at a time, so timing isn’t critical. You can ingest caffeine immediately before and during your races without worrying about a delay in the effects. Is it bad to use caffeine or drink coffee every day? Specific caffeine supplementation for performance should only be used during races. If you’re a routine coffee drinker and waking up is impossible without your cup o’joe, than you can stay on your normal routine. However, it’s not advised to supplement before every workout. Unlike a race, when you want to run as hard and fast as you can, workouts are usually sub-maximal efforts designed to hit a specific physiological energy system. Supplementation to boost your performance shouldn’t be necessary. Do you need to practice with coffee or caffeine? The age-old maxim applies to caffeine supplementation. If you’ve never experimented with using caffeine before a hard workout, don’t let the first time you try it be during a race. You may find it gets you too jittery or gives you an upset stomach. You don’t want to ruin all your hard training because you took too much caffeine. Should runners use caffeine pills, coffee or supplements? While coffee is the most common source of caffeine, many runners can find coffee to be hard on the stomach. For example, coffee gives me heartburn if I drink it before I run. So, you may need to experiment with what works for you. Do you need to stop taking caffeine before a big race to get the maximum effect? Surprisingly, the answer to this question is no. Research has shown that runners receive the same performance boost from caffeine whether they are habitual coffee drinkers or they drink only the occasional cup of tea. Humans do habituate to some of caffeine’s effects, such as elevated pulse and blood pressure. So, while I don’t suggest it’s healthy to have a direct line to Columbia for your daily fix, you’ll still get the performance enhancing benefits of caffeine if you drink more than the occasional cup. Amazing article. Very thorough. You guys really do your research. It has always been difficult for me to drink coffee in moderation. I would start out drinking a cup a day and it would end up being a pot before too long. I quit cold turkey about 6 months ago. I felt like quitting allowed me to sleep better and, in turn, train better. Never tried using it as strictly a performance enhancer. I might now after reading this. Thanks for the compliment, Jason. Yeah, if you’re drinking too much coffee, it can definitely affect your sleeping patterns. When people ask me if I want a cup after dinner or something, I always joke and say “sorry, I only use caffeine as a performance enhancer”. It gets a laugh, but it’s kind of true. Can you write the same article, but for beer….? Not a bad idea, actually. While there is certainly no (or at least very little) performance enhancing benefits to drinking beer – for running at least, it would be interesting to look at how it can or cannot derail your training. I always quit alcohol entirely the week of the race. Love a beer after a good race though. Probably not the ideal recovery tool. Actually, beer has a significant amount of carbs in it which is ideal for recovery. After weekend races in college we would go out and get a nice jag going, wake up the next morning with little to no soreness and then be able to pound out a nice workout two days later. I’ve tried other things for recovery but for some reason the (my) Body responded well to the nector of the gods (fortunently). I just ran my first half marathon in Toronto. I found the use of 2 caffeine pills, spaced throughout the race, plus my high carb snacks (Awake chocolate – has equivalent of caffeine in half cup of coffee, and Reeces peices) plus hydrate every few km, resulted in a really fun, exciting run for me. I am 51 and had a time of 2 hr 14 min. which beat my “unofficial” half around the block at home by 8 minutes. I would definitely recommend supplementing with caffeine as it works for me, plus find a snack you really like. I couldn’t gag down a gel and wasn’t keen on the chew candies they sell for running. I’ll take the comments in a different direction….. I use coffee to help me, uh, you know, jump start the stomach emptying process prior to going out for a run in the morning 🙂 Works great for that! Wow, I really like the links to the research publications. That’s a really nice touch that just confirms all the credibility. Jeff keeps getting more and more thorough with his articles. I may have to cancel my subscription to Runners World and do all my reading here. (except I do like the ads in Runners World). Hope everyone has had a nice holiday so far! This was a great article that I have been interested about in the past. 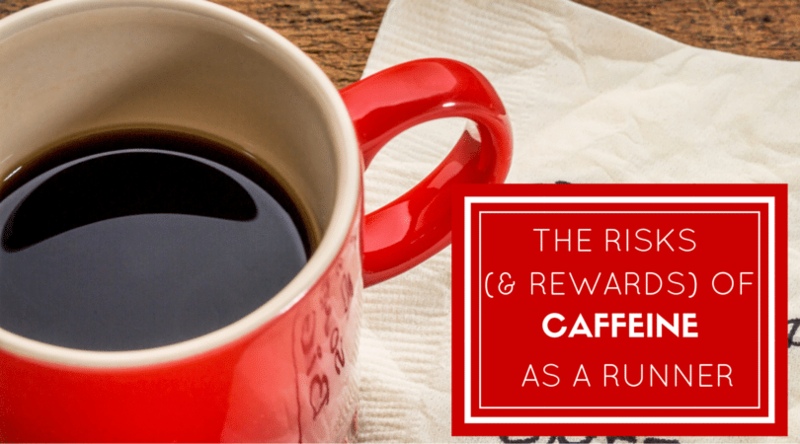 I have never really been into coffee but have heard from time to time how it benefits runners. I decided to try it last week before one of my workouts (3x2mile repeats). I felt great before and during the workout. I had a lot more energy going into the workout than I normally feel especially because I am a post work runner. I am not sure it the caffeine helped me nail the workout or if it mentally made me think I had more energy. Either way I think that it paid off. My question is since I am not a regular coffee drinker how many times should I try drinking coffee before I should feel comfortable doing it before a race? Also after I know that the coffee will sit right in my stomach how many times should I drink coffee before a run to make sure I am use to it. (once a week, once a month,etc). It made alot of sense in the article when it said you shouldn’t drink it during workouts because workouts are meant to prepare you for race day. Please let me know what your guys thoughts are. I am glad you enjoyed the article, Bill. Great questions, too. I think you should try drinking coffee or using caffeine before a race about 3-4 times to ensure you’re comfortable with it. I never liked coffee before a race (it gave me heart burn), but celestial seasonings fast lane tea worked really well. You don’t have to you use coffee to get the benefit from the caffeine. Likewise, I would maintain drinking caffeine every 3 weeks or so, just to keep your system used to it. Perhaps the days you have a big workout or just a day you’re feeling flat would be a good choice every once in a while to keep you acclimated. Should be a nice thing to add to the race day routine to see if we can’t push everything a little further! I rarely drink coffee. Last night after my dinner I fancied a cup, so I had one. An hour os so later I went for a 5k training run 9I’m doing a 10k run next week), and knocked 1 minute 20 seconds off my best time. Started me thinking whether careful use of caffeine might be a boost during the race, and that in turn led me to this web page. Very interesting reading and confirms what I’d suspects – the caffeine probably helped me out a lot. I was concerned whether over the course of a 10k run you might get a high followed by a low, which would obviously be counter-productive, but it seems like that wouldn’t be the case. We don’t get a crash from the high we already receive from running in the middle if the run. Also, because it helps us produce more endorphins than we already do the “high” will last longer anyways. Granted, everyone has a different metabolism; therefore, we all reach our peaks a lows at different times, but the duration of caffeines effects last for hours. Plus, the effects of running, though they might feel tiring, will keep you energized anyways (again everyone is different but even though we may feel tired we couldn’t go take a nap right after running). Another point is this–When our body starts telling us to stop (when we feel tired) we have not even come close to using all our energy (i’m not sure of the exact number but I think it’s under 20%). If caffeine helps enhance those chemicals which energize us anyways, those energy stores would be depleted slower. I’m a director for a tv station and I use the Dr max Powers Burn on occasion when I need a boost. Great way to wake you and keep you more alert. I wake up at 3 AM every weekday and sometimes it catches up to me. If I take it before the show it keeps me alert throughout the two hours that I direct. Don’t drink soda and ingest all those extra calories, dyes and corn syrup. Drink some water and take the Max Powers Burn. I’ve been using them for years when I need to and they still work for me everytime. So glad I found this product. Thanks for the extremely thorough article. For my caffeine, I use gu and Jolt Energy gum. I read about Jolt a while back and really like it. Hi I’m doing half marathon tomorrow, I’m thinking of trying caffeine for the first time? Would I be ok to have a coffee half hour before my run ? Hi Susie! A good rule of thumb is that you should never try anything new on race day. Therefore, NO, it would not be a good idea to have coffee before your race. Experiment with caffeine and coffee on your training runs first. If you find it works well, then you can try on race day. Good luck! One interesting fact with coffee is that instant coffee has much more caffeine than espresso. I read somewhere that a single shot of espresso has 30mg caffeine but a single teaspoon of instant coffee has 70-90mg. ..Also that caffeine has zero taste .. all the flavour of espresso coffee is in the oil. Question: It says that an optimal amount for a 150lb person is 340mg. Is that accurate? a can of Red Bull has only 80mg and most coffee only has about 150 or so, It seems one would have to ingest a lot of coffee to get the best amount. Maybe caffeine pills would be better? My wife works at Starbucks and she gets me the instant Via coffee and that only has about 140 per cup, I’m not big on coffee so this seems like an awful lot of coffee to drink before a run to get the optimal amount of caffeine. I’m about 160lbs so i’d have to have about 3 cups of coffee. I am a big coffee drinker, so this is a big plus for me. Halleluiah, Coach, for writing this article! I’m sharing this with my runner friends and my husband who thinks running on caffeine is a no-no. Btw, do you think you can write an article on migraine and running? I am a Indian .my age is 19 and weight is 58kg .i am a 1500mtr runner .so sir tell me that at what time i will take caffene and what is the doses ? I am happy whenever I read any positive comments about caffeine since I love my morning coffee so much. So thanks for putting all the research together. But I’m also an English teacher, so I have to say that “dearth” as in “after reading this dearth of information” is the wrong word. “Dearth” means “a scarce supply; lack.” In contrast, you supplied an abundance of information. (Sorry, I just couldn’t help myself). And I hope that I NEVER see the word “dearth” used in reference to the world’s coffee reserves! I take a caffeine gel 20 mins before the start of a marathon or HM race and then alternate 1:1 “normal” gel/caffeine gel as the race progresses. If I know there is a particularly difficult section coming up then I’ll go the caffeine about 20 mins before hand e.g. Heartbreak Hill, Boston. Great article. Never drink caffeine before an event. Ran a half marathon a week ago & took 4 minutes off my previous two half marathon times. Had a coffee before the race, ( dont know why, just did. ) felt great. It didn’t seem like an effort. Maybe the caffeine was the reason why! Very good article. Can we use the coffee powder mix with lemon & salt? Awesome article! One correction though, Colombia is the name of the country, not Columbia as in South Carolina. Hi. Caffeine tablets work well for larger doses and do not upset most people’s stomach. They commonly come in doses of 100 mg or 200 mg. Often times they can be bought in capsules, so you can pop open the capsule, pour out the granules and use as much or as little as you want. For example, on a tempo run, i might only want the effects of a weak coffee, so i woud pour half the granules of a 200mg capsule into my cup of tea, and that about does it. I drink my coffee in the morning along with a lot of water, I want more caffeine but not the extra trips to the bathroom and liquid sloshing in my stomach. Been using Gu gel for about 4 years, ready to use more caffeine!! For my weight I’d need about 300mg I’m used to 40! Couldn’t possibly take 2 packs of clif shot blocks or chomps? Anything else out there that’s simple, quivk, effective without the extra liquid?? Thanks for this article! All the suggested drinks to help you get your caffeine are great sources, but the best one i found was Nos Active Energy Drink. It packs a forceful, if not un benificial punch of caffeine! It contains about 221 mg per 22 oz bottle. its probably the largest source you can get from a drink. Great article. We love a shot of coffee before a big race. none of the other so called high caffeine drinks come close to a shot of espresso. Thanks Gaz, glad you found something that works! I have to run 1 km in 4 mins for railway PET. my weight is 72 kg age is 31. I can run in 1km in 5 mins. I have 20 days for race. How can I cut my time to 4 mins. Hi Ritesh, you would be best off making sure you are fueled correctly, and racing the 5k to perform. Here is an article on race plan for 5k https://runnersconnect.net/race-plan-5k-run/ and 5k specific training https://runnersconnect.net/running-training-articles/5k-specific-training/ hope this helps! I’ve been off caffeine for years. When I used to drink cola, if I went too long without a drink (over a day), I’d get a bad headache. I never got into drinking coffee though (even the smell of coffee nauseates me). I’ve been looking at the gels and other fuels, and basically have been focusing on those without any caffeine. But after reading this article, I wonder if they might be useful once I start looking at longer runs. If I only use it sparingly, e.g. a few times during training to gauge the effects, and during an actual race itself, would that avoid the addiction/headache type issues? Or would I be courting headache/withdrawal issues each time I use it? Hi Louis, thanks for sharing your thoughts. It would probably be helpful for you in the longer races, and you may enjoy this podcast episode with Alex Hutchinson where we discuss it further https://runnersconnect.net/running-interviews/alex-hutchinson-performance/ Take a listen and see what you think. If you saved it for race day and workout days, you should not have the same problems you have before as you will not be taking it enough. Hope this answers your question.